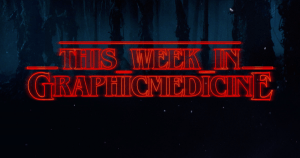 My pick this week isn’t strictly speaking graphic medicine, but rather, a highlighting of a similar discipline, with a great deal of overlap: Graphic Justice. You may already be familiar with this idea – they have had a website, a listserv, and a Twitter page for some time now, as well as a few meet-ups, such as this one last year in NYC. I bring this up this week because, as was brought to my attention by the amazing Ebru Ustundag, they are now running a Facebook group as well! The overlaps for graphic medicine and graphic justice are numerous – bioethics alone is filled with room joint discussion – so I encourage you all to join their new group, explore their other spaces, and get going on this important field! Call: Call for participants – using sequential art in professional psychological practice. Scholarly: Developing a Web-Based Comic for Newly Diagnosed Women With Breast Cancer: An Action Research Approach.